Mauri’s recovery from back surgery has gone well once we got past “hell week” (the first following). He’s obeying the doc’s instructions to walk rather than ride his bike. He’s resumed most of his around-the-house tasks, the most recent feeding the dog. But on Friday I fly to the East Coast, leaving him alone to fend for himself. He isn’t allowed to bend or twist yet, so he keeps gadgets handy for those rare occasions when he drops something on the floor. Anticipating the need to “clean up the yard” (a.k.a scoop poop), Mauri went shopping for a cool tool to aid him in the task. 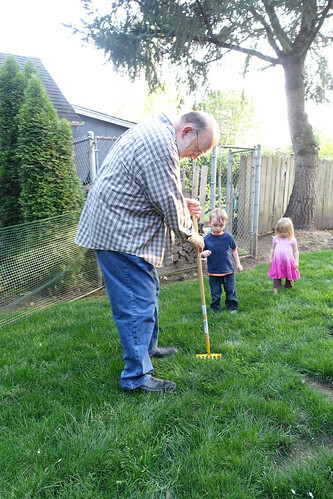 Here he demonstrates his super scooping skills for two fascinated grandkids. Go pooper-scooper, may the Force be with you!